Asopado is a sort of a cross between soup and paella. This Pressure Cooker Asopado is quick and easy to make in an Insta Pot and has a bright fresh flavor. An Instant Pot is one of the most popular brands of electric pressure cookers. 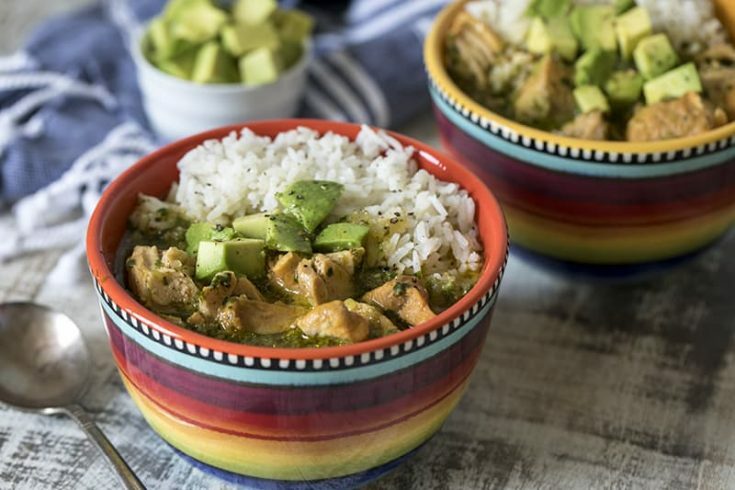 They are easy to use and your Instant Pot can help you create this Pressure Cooker Aposado! This Pressure Cooker Asopado recipe is slightly adapted from a recipe sent to me by Felicia, a Pressure Cooking Today reader. Felicia posted a comment on my Pressure Cooking Today Facebook Page saying she loves making Asopado in her pressure cooker. I’d never heard of Asopado before and Felicia was kind enough to email me her recipe. She said, “I love converting my grandmother’s great Mexican food recipes to the pressure cooker.” It sounded like a great recipe that my family and my readers would love, so I asked if I could share it with you. Luckily, she agreed. After a quick search on the Internet I discovered that Asopado is a traditional dish of the Caribbean. Sort of a Latin American version of Spanish paella. A soupy chicken rice dish made with a sofrito. The Spanish word sofrito means to lightly fry something, In this recipe you fry a poblano chili pepper, onion and garlic. Then blend it with cilantro and olive oil to create a pesto-style paste (shown above). The fresh tasting, colorful paste is stirred into the Asopado after pressure cooking and it adds a bright fresh flavor to the soup. The recipe also uses Caldo de Tomate (shown above.) I was unfamiliar with Caldo de Tomate, but Felicia assured me that it is Knorr brand that is widely available. I bought my jar at Winco. It’s a powdered tomato and chicken bouillon that adds a nice flavor to the water in the recipe. I only used half of the sofrito in the soup recipe. You could add more to taste if you like. Felicia commented that the sofrito mixture can be stored for up to a month and used wherever it would be tasty! Leftover sofrito would be a great addition to my Pressure Cooker Cilantro Lime Chicken Taco Salad or my Pressure Cooker Turkey Lentil Tacos. I hope you’ll give this recipe a try. Thanks so much Felicia for sharing it with us! Prepare Sofrito: Select sauté and pre-heat the pressure cooking pot. Add 1 tablespoon oil and sauté the pepper, onion and garlic until tender. Turn off pressure cooker. Transfer mixture to a blender. Add cilantro and remaining 2 tablespoons of oil. Blend until it has the consistency of pesto. Add water and Caldo de Tomate to the pressure cooking pot and stir to dissolve. Add chicken thighs. Lock lid in place, select High Pressure and 9 minutes cook time. When timer sounds, turn off pressure cooker and allow pressure to release naturally for 10 minutes, then do a quick pressure release. Carefully remove lid. Use a slotted spoon to remove chicken thighs to a cutting board. Cut chicken into large bite size pieces. Add half of the sofrito and apple cider vinegar to the liquid in the pressure cooking pot. Add diced chicken. Select Saute and simmer for 10 minutes. To serve: add a scoop of rice to soup bowls and ladle soup over the top. Garnish with avocado. Made this exactly as the recipe, was way too juicy, had to add slurry to some what make it thicker. I think 3 cups of water would of been plenty. It tasted good but way to runny. Hello, the proper spelling of this dish is “ASOPAO” (without the “D”). I’ve also seen several references to Mexican cuisine, which is also incorrect: this is originally a Dominican dish which was popularized in Puerto Rico. Great – please let me know how you like it. I’d like to replace with chicken breast.. How many ounces would you recommend? Thanks. I love poblano and am looking forward to trying this recipe. Hi Lisa – I would use 3 large (8 ounce) chicken breasts and reduce the cook time to 6 minutes. Enjoy! This sounds delicious Barbara, and I finally got an Instant Pot so I’m going to try it! Our Safeway and Kroger stores both carry the Tomato Bouillon but it’s tucked away in the Hispanic foods section. 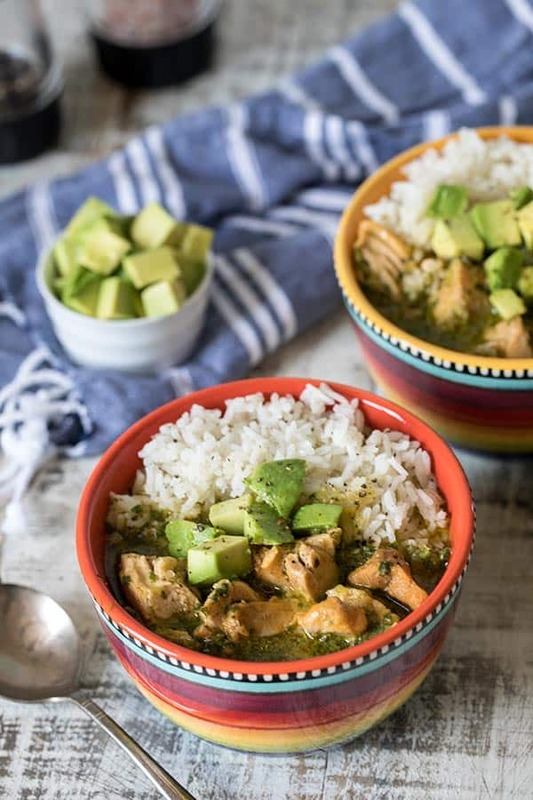 I use a spoonful in my Mexican-style rice recipe, which I will have to try in my instant pot since it has the sauté function. I’m excited to have a simple new tool to use in the kitchen, and a treasure trove of recipes on this website and in your new cookbook. Thanks Barbara! How many servings does this yield? Thanks for your many interesting recipes! Quick question. Instructions #4… add half sofrito and ACV. if adding half the sofrito, what happens to the other half? assuming add half only pertains to the sofrito or is it half the ACV also. not sure if I missed something. Hi Jacki – yes, half of the sofrito and all the apple cider vinegar. Leftover sofrito would be a great addition to my Pressure Cooker Cilantro Lime Chicken Taco Salad or my Pressure Cooker Turkey Lentil Tacos. Or any other Mexican dish you prefer. I’ll have to check and see if our store carries the tomato bouillon-it looks familiar like I might have seen it on the shelf and walked right by. We do love new chicken dishes and this one looks so nice and hearty. What a surprise. When I finished the Sofrito I tasted it. Nothing special. When I finished the pressure cook I tested it. Still nothing special but when I mixed them together WOW. My wife and son both could not stop talking about this soup. I love that you made it already Jim! Thanks for taking the time to comment and share your experience with everyone. Thanks, Jim, for the comments, and Barbara for the recipe. I will be looking for the Caldo de Tomate next time I get to Winco, because I love a new ‘bowl food’ recipe, and another way to add a new seasoning to my cupboard that I don’t have to refrigerate. This looks so good, and it’s going into my ‘try soon’ bin. My pressure cooker has given me a new interest in cooking, after doing ‘conventional’ cooking for over 50 years. I shy away from fad appliances, but this one has me eager to explore. I wouldn’t have been as brave if it weren’t for you and Hip pressure cooking. You women rock! Is there a substitute for the tomato bouillon as I have been totally unable to find it other than for a high price on Amazon. Would a tablespoon of tomato paste work? 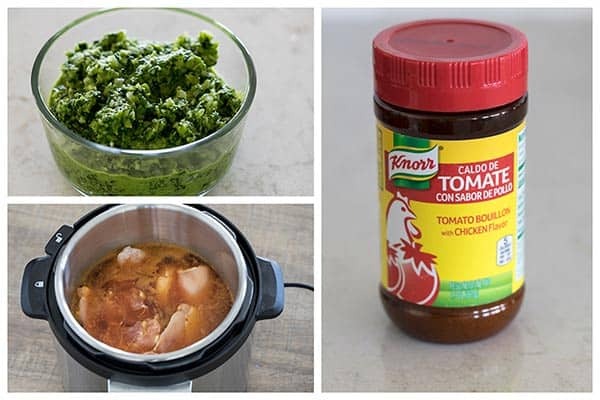 Hi Kandy – if you can’t find it you could substitute tomato paste and chicken bouillon. What do you do with the other half of the sofrito? Hi Cheryl – it’s perfect for any type of Mexican dish you’re serving. had an overload of plumb tomatoes. I dried them and then puliversized them into powder. This sounds delicious! If I cheat and use store-bought sofrito, what quantities would be called for in this recipe? Hi Gwendolyn – about 3/4 of a cup.